If you are an HVAC technician, then you know the importance of a handy tool like a refrigerant leak detector. 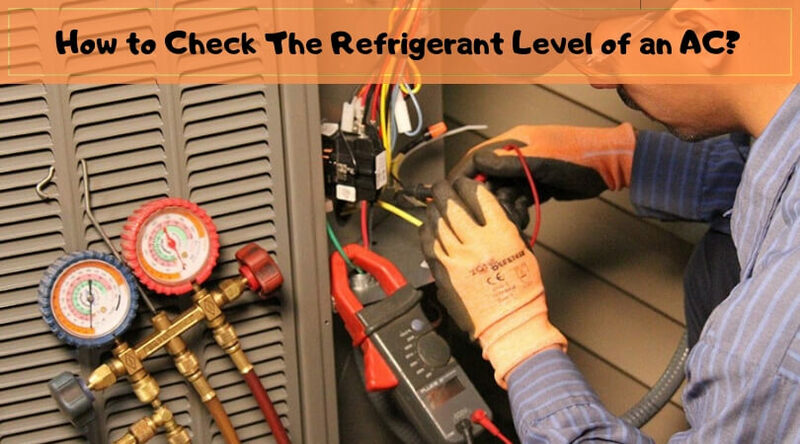 It helps to diagnose and rectify the issue within the refrigerant and AC machine. Detecting the problem in an HVAC system is a skillful job and you need a proper tool for checking the leak for a particular type of refrigerant. 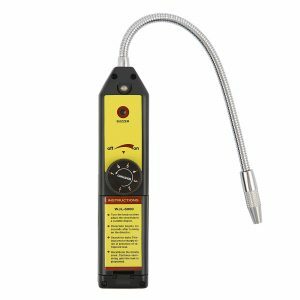 Today, we will take a look at the reviews of the best freon leak detectors available in the market. It doesn’t matter in which part of the world you are living, because such tools like an HVAC leak detector you need to use in your daily job, obviously if you are in the HVAC field. Identifying the leak at the job site is an important task and if the customer is a business or plant, then it is even more important as it can affect the production of the specific products. So, it is vital to have a top-quality tool with you if you are serious about your job. Along with the proper knowledge, a right tool is also needed to get the job done, that’s what the expert says. The portable refrigerant leak detector from Signstek is one of the oldest and most reliable HVAC tools out there. There is a big reason that even after years, such type of detector is not changed and that is, it works perfectly. If you are a professional who is just starting out a career in the field or a business person who wants a collection of good-quality tools for their techs, then this model is the perfect option to choose. 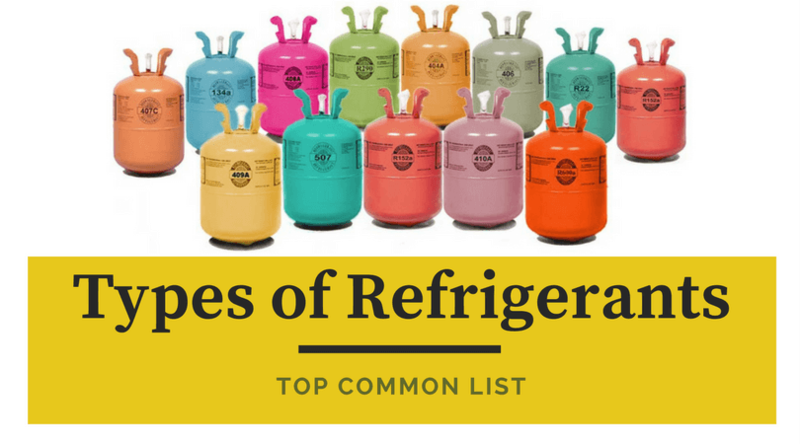 Along with freon, it can detect all kinds of halogenated refrigerants including CFC: R12, R11, R500, etc. HCFC:R22, R123, R124, etc. HFC: R410a, R404a, R125, etc. leaks. It comes with a 14” flexible probe of stainless steel which helps you to reach out in the tightest of spaces. It has a real-time & reset time sensitivity adjustments with a spare sensing tip to provide reliable operation. You can use this HLD-100+ leakage detector is various HVAC applications like hospital sterilizing equipment, circuit breakers, dry cleaning systems, fire-extinguishing applications, and many more. It has two working modes; Continuous and no limit with instant reaction time and 2 seconds of resetting time. This detector has the maximum sensitivity of 0.1 oz/yr (3g/yr) for detecting the refrigerant leaks. 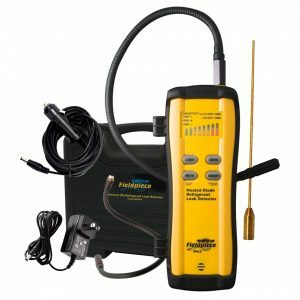 This freon leak detector from LotFancy is one of the most affordable good-quality HVAC tools available in the market. Its ease of use and simple functionality are the top reasons for its popularity. With the ability to detect all types of halogenated refrigerants including but not limited to the HCFC, CFC, and HFC, it is one of the most recommended leak detectors by the experts in the field. It has the maximum sensitivity of 6 g/yr to detect the refrigerants like R11, R12, R22, R124, R125, R404a, R290, R134a, etc. With the real-time sensitivity, it can automatically adjust to the most optimum state for detecting the leak. The tri-color screen will display the battery percentage, a flashing light & siren tune for the leak alarm indication. It is perfect for use in the areas like automobile air conditioner, pipe leakage, refrigerators, storage repairs, etc. It has the 7.87” flexible probe which will help you to reach to the hard to reach corners. You will get a one-year warranty along with the guaranteed satisfaction from the company. 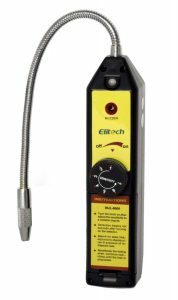 The Elitech WJL-6000 is one of the most affordable leak detectors for the HVAC technicians. This heated diode detector can check the leaks of any refrigerant that contains fluorine or chlorine including the common refrigerant classes like HCFC, CFC, and HFC. It is featured with the corona sensor & advanced leak detection technology to provide a reliable function and an easy operation. It has a response time of 3 seconds and a warm-up time of 6 seconds. The seven adjustable sensitivity settings with the maximum sensitivity of 0.21 oz/yr. It comes with different indicators like visual & audible gas leakage indicator and a battery status indicator. A 7.9” flexible probe will help you to rich difficult corners and spaces to detect the leak. The batteries will last up to 50 hours so you will not need to change them too frequently. An included black storage bag will allow you to carry the tool anywhere you go with ease & comfort. You will also get a user manual to understand the functionality of this refrigerant leak detection machine. It weighs 8 ounces and has a compact design with a size of 9.2 x 2.4 x 3.2 inches. The company provides a one-year replacement warranty for the product. Fieldpiece is one of the most popular brands for providing best-quality HVAC tools. 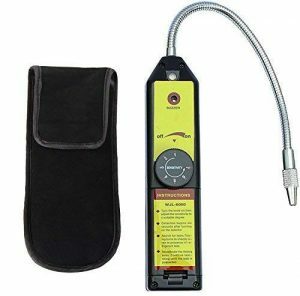 The SRL8 heated diode leak detector can find the leaks of all types of refrigerant types including CFC, HFC, HCFC, etc. This tool is known for its speed and accuracy of detecting the harmful leaks of refrigerants. On a single charge, it can work for almost two full days of your job. You can use the rechargeable batteries to operate this tool. After every two seconds, it will automatically go to zero until a leak is found. You can also set it to zero manually. It has filter systems which will keep it protected from the moisture and other harmful elements. For example, if you unintentionally hit the oil or condensation, then the filter will swell and shut off the pull to the sensor for preventing the failure. This HVAC tool has three sensitivity levels from 6.6 oz/yr to <0.1 oz/yr. The audible and visual alarms with LED indicators will alert you when the leak is detected and when the battery is dying. You can mute the sound if you want to perform a silent operation and don’t want to disturb others around you. It comes with a 9-inch flexible probe to help you reach awkward areas and corners. The leak detector unit comes with five O-rings and ten replacement filters as well as an RRE2 rigid extension probe. 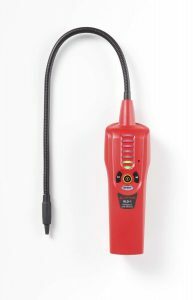 The HDE refrigerant leak detector is a portable, handheld device to help you analyze the entire HVAC system like refrigerant, AC, controllers, pipe fittings, house to line couplings, plants, etc. It has an immediate response time with an operating temperature of 30-degree F to 125-degree F. This device will help you to save the money from buying expensive tools for detecting leaks in your HVAC applications. 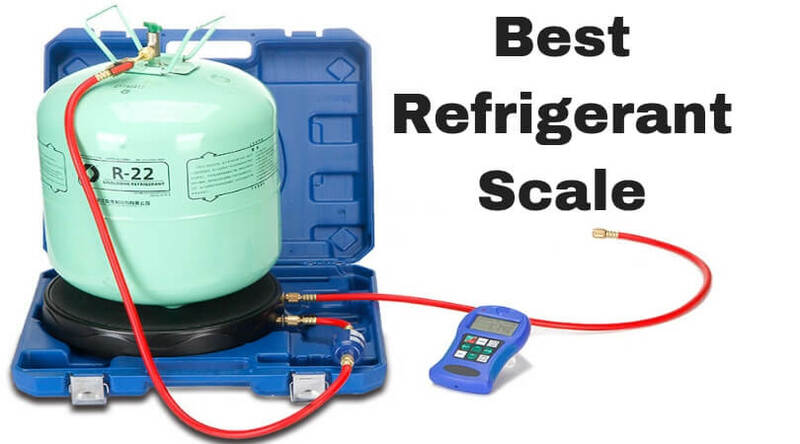 It can analyze and find the leaks for almost all types of refrigerants including CFC, HCFC, HFC, etc. The LED voltage display will indicate you for the working of the detector (Green light means normal operation, Orange light means below optimum performance). It comes with a probe in a length of 6.5” to help you cover the hard to reach areas in a particular system. You can easily adjust the seven sensitivity levels from the dial. The sensitivity automatically adapts to the various operating conditions. It has a warm-up time of six seconds approx. and two working modes; continuous & no limitations. In the box, you will get one freon leak detector, one storage case, and one instruction manual. The Amprobe RLD-1 will help you to troubleshoot the leak problems in your HVAC applications quickly and accurately. Due to its state-of-the-art technology, it can detect a wide range of refrigerant leaks with explicit and accurate readings. Its microprocessor controlled semiconductor sensor can identify the leaks of halogenated refrigerant types like Freon, R-134a, R-404a, R-407a, R-22, etc. It comes with a suction pump which cleans the sensor and helps to improve productivity. The 40-cm long flexible stainless probe will help you to detect the leaks at hard to reach areas and corners. It comes with a tri-color LED visual display and audible alarm to indicate the leak. If the application has an airborne refrigerant, then you can use the ambient concentration reset feature to detect the leak. It will take only 45 seconds to warm up after you power it on. In the package, you will also get two alkaline batteries, one AC adapter, one carrying case, one leak check bottle, and a user manual. 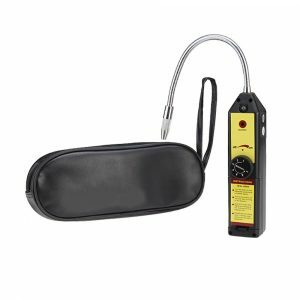 This refrigerant leak detector from Enegg is the cheapest product on this list, but that does not mean it lacks any potential feature of a good-quality HVAC tool. It is equally sensitive to all the CFC, HFC, and HCFC refrigerants and provides accurate, clear readings of the leaks. It has LED visual display and audio alarm to alert you whenever a leak is detected. You can use the reset feature of the tool for ignoring the ambient concentration of halogen. It will help to test and identify leaks in the applications like fittings, service plants, hospital sterilizing equipment, house to line couplings, etc. This tool has a reset time of 2 to 10 seconds and a warm-up time of 6 seconds approx. The flexible probe has a length of 6.5-inch which will help you to cover unreachable areas like tight spaces and corners. Its handheld, portable design allows you to carry it anywhere at your job site comfortably. You will get one gas leak detector, one storage case, and one instruction manual. Before the use of the HVAC detectors, the technicians were using some traditional methods to detect leaks of the refrigerants. 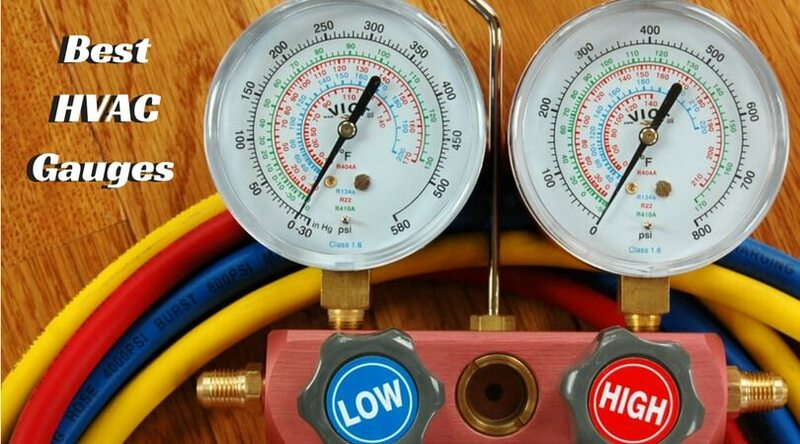 If you are an HVAC professional, then you may have used the soap bubble technique or the ultraviolet dyes technique to find the refrigerant leaks. But, with such an improvement of the technology, most of the HVAC technicians today don’t leave for the job site without a freon leak detector in their toolbox. But, just like other tools, it also comes in different types. Heated Diode: This type of leak detectors is the most popular. It collects the air from the inspection area before heating it to a level where the molecules will separate. Then the diode will detect if there is any refrigerant in that air and alarms the sound and light to warn you about that. Corona Suspension: This type of detector is the oldest of all. 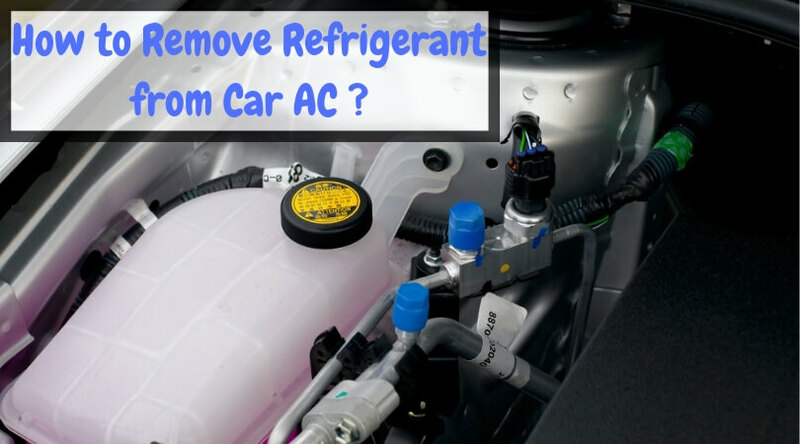 It works on a simple method in which it uses a high-voltage corona on the sensor to pick up the elements of a refrigerant in the air and if the result is positive, it sounds the alert. Ultrasonic: This detector type is the latest technology in the market right now. 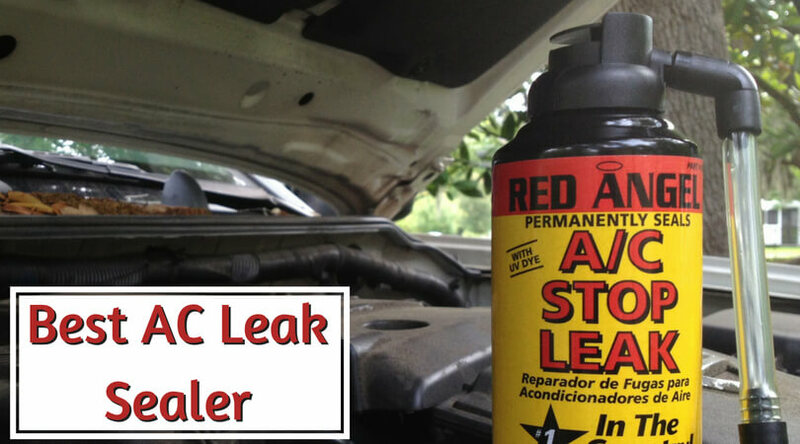 It uses a sound method to detect the leak. A human ear can’t hear the leaking sound of a refrigerant, but this tool can hear it and it straightaway alarms you for that. 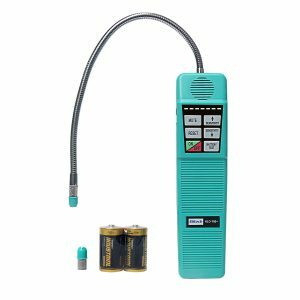 Each type of refrigerant leak detector is useful, but I can say that the heated diode type of tool is more famous among all because it is widely used by HVAC professionals worldwide. That does not mean that the other two are untrustworthy. The ultrasonic technology is gradually gaining the popularity and many technicians still swear for the oldest corona suspension technology. There are a few things which you can keep in mind if you want to get the real value for your money. Check the top aspects below to buy a top-quality refrigerant leak detecting tool. 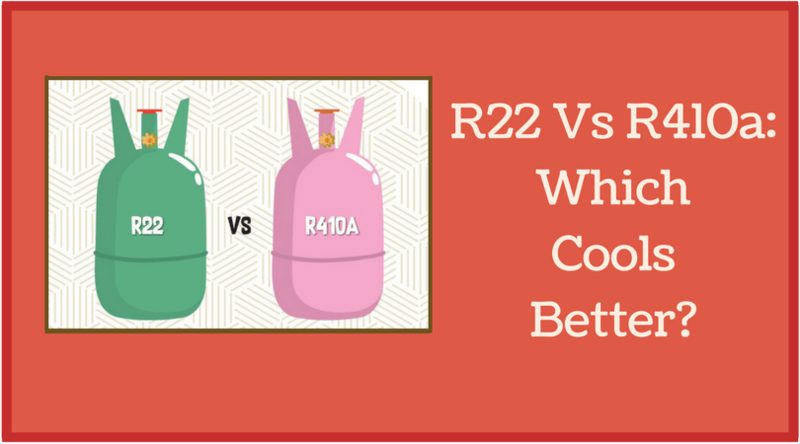 Detecting the types of refrigerants: One of the most essential things for a leak finding tool is the refrigerant types it can handle. The machine must detect most of the refrigerants if not all of them. But, remember one thing that the detector that can detect as many refrigerants as available can cost more than the others that can identify leaks of common refrigerants. So, check your field applications and your expertise to determine the choice of the leak detector for that. Working Speed: The time is money and to reach different locations for attending the complaints, you need to identify the leaks as soon as possible. So, look for the model which comes with good-quality sensors, less warm-up time, and features to detect the leak quickly. 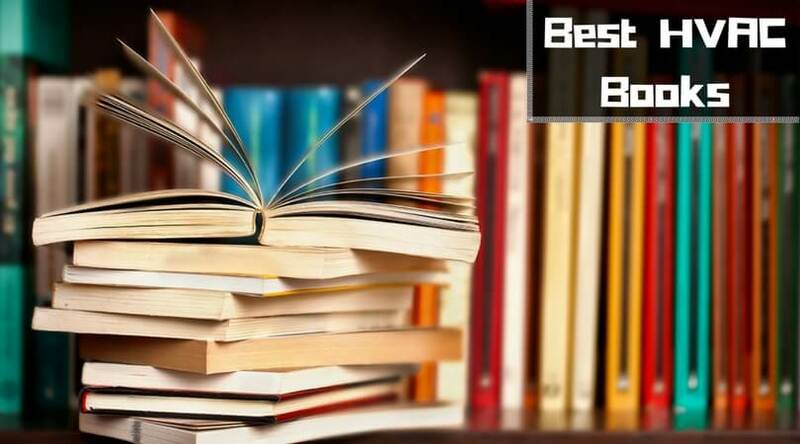 I recommend going for top brands rather than opting for the cheap options. Sensors: Depending on the type of detector, it comes with different kinds of sensors to identify the leak in the HVAC system. An ideal refrigerant leak detecting tool comes with a good sensor quality and durability. And as you guessed the next sentence right, more durability and efficiency means a higher price tag on the tool. Battery: The leak detector should last for as long as possible before running out of battery power. If not more, it should work fully at least for a full day to finish your job efficiently. Many modern leak detectors also come with rechargeable batteries which can save your time and money both from buying new batteries frequently. Warranty & Price: Always check for the warranty on whichever product you buy online or offline. The top brands provide good-quality HVAC tools which last for long, but still, you need to confirm how long the warranty period for a particular machine because you never know what can happen to it. At last, the price also matters. There are some cheap leak detectors available in the market, but there is no assurance of the working and durability. So, it is advisable that you opt for a good-quality tool even if you have to spend a little bit more than your original budget. 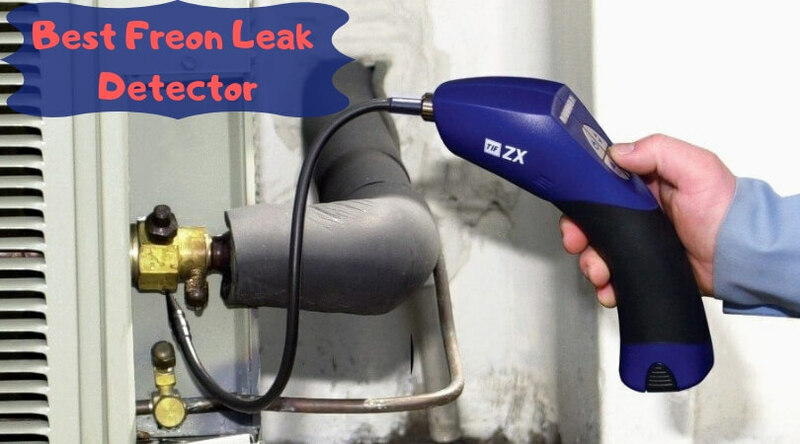 Getting one of the seven reviewed leak detectors above will help you to find the freon refrigerant leak faster than the other ordinary HVAC tools. 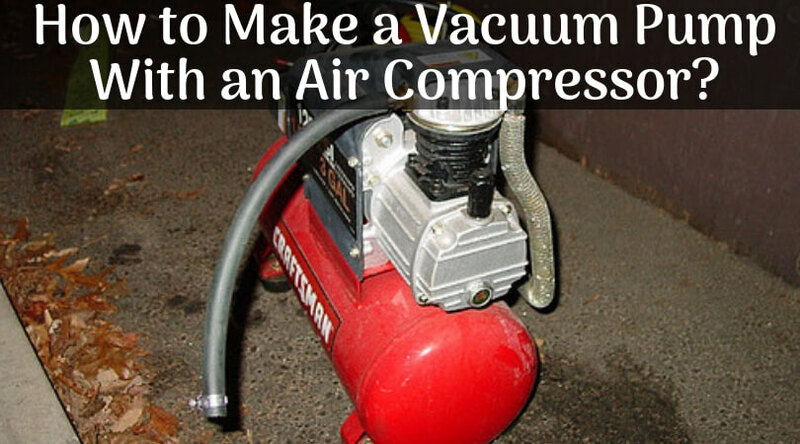 It will also help you to save your time & money by not changing the machine from time to time. Moreover, a good-quality refrigerant leak detecting device will save your customer’s money as well and also contribute a little in saving the environment. Any freon leak detector that you choose from the list here will be a worthy addition to your HVAC toolbox. I hope I was good too for helping you make the decision for buying a quality HVAC machine. And at last, which tool do you think will suit your needs? 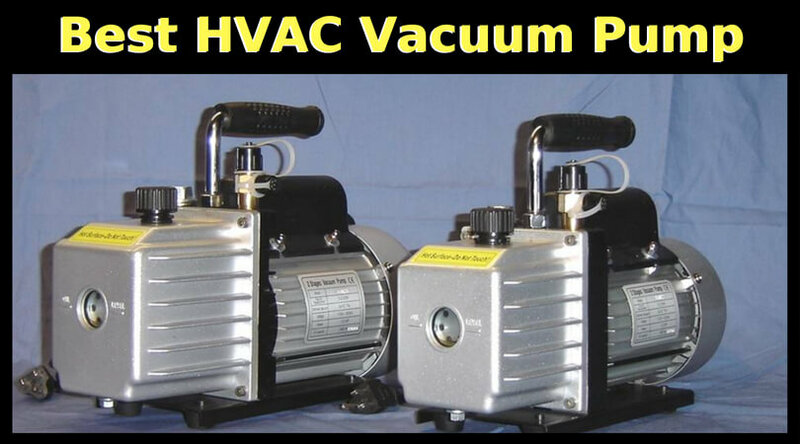 Are you an HVAC professional or a business owner buying a tool for your techs? Share your inputs in the comment section below. I am Salina Hocutt. I have worked for five years as a professional in the HVAC industry. But due to the personal commitments I made, I had to quit my job. My interest in the refrigerant machines didn’t sack though. That’s why I along with a team of a bunch of professionals started this blog named as Refrigerant Recovery Machines. Here, I will share all that I know as well as the new technology, products, and techniques that are being introduced in the industry.